Anaphoric elements (e.g. reflexives such as himself, and pronouns such as she and his) are among the most frequently encountered words in virtually all human languages. The most important feature of these linguistic elements is that they cannot be fully interpreted in isolation, but depend on other elements in the utterance or text instead. Hence, an important question for linguists and psycholinguists is how our language system constructs anaphoric dependencies. 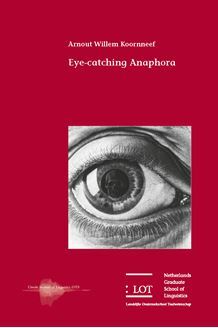 In this dissertation Arnout Koornneef discusses the findings of a series of eye­tracking and self paced reading experiments, aimed at evaluating the linguistic Primitives of Binding (POB) model (Reuland, 2001). This account proposes that we should distinguish between syntactic anaphoric dependencies (A­Chain formation between a reflexive and its antecedent), semantic anaphoric dependencies (bound­variable pronouns) and discourse anaphoric dependencies (coreferential pronouns). Furthermore, a general economy principle governs the division of labor between the different subcomponents of the anaphora resolution system: the syntactic process is more economic than the semantic process and, similarly, the semantic process is more economic than the discourse process. The results suggest that this economy hierarchy has behavioral reality and, in addition, that anaphora resolution occurs in a fixed sequential order, i.e. syntactic anaphoric dependencies emerge before semantic anaphoric dependencies and, in turn, semantic anaphoric dependencies emerge before discourse anaphoric dependencies. At a more general level, the reported behavioral results demonstrate the importance of incorporating linguistic theories into (neuro)cognitive approaches to language comprehension, since linguistic theories clearly define the object of interest (e.g. the nature of anaphoric dependencies) and they furthermore generate important research questions that would not have emerged otherwise. The author combines insights from theoretical linguistics, psycholinguistics and neurolinguistics and this dissertation should therefore be of interest to scholars in any of these domains.